Drew Brees was excellent again, as he scattered big-time throws all over the field. He threw just his second interception of the year and threw for just 171 yards, but anyone that watched the game will see Brees was in control the whole game. It was efficient as always for the Saints’ offense, but a few performances stood out. Right tackle Ryan Ramczyk was dominant in run blocking and protecting Brees, and Alvin Kamara made the most of his blocks, as he was decisive with his cuts and finished with power on runs. The best player on the field tonight was undoubtedly Cameron Jordan. He feasted on the Falcons’ offensive tackles and tight ends from the first snap to the last and constantly made a presence in the Falcons’ backfield. The most impactful play in football is surely turnovers, and the entire Saints’ defense made a real effort to go after the ball on Thursday night. The Saints’ defense forced a whopping five fumbles and also came away with an interception. The ability to give the high-powered Saints’ offense with extra possessions is deadly and buried the Falcons’ chances early. It wasn’t pretty on the defensive side of the ball for the Falcons, as Brees and company did what they’ve done all year. 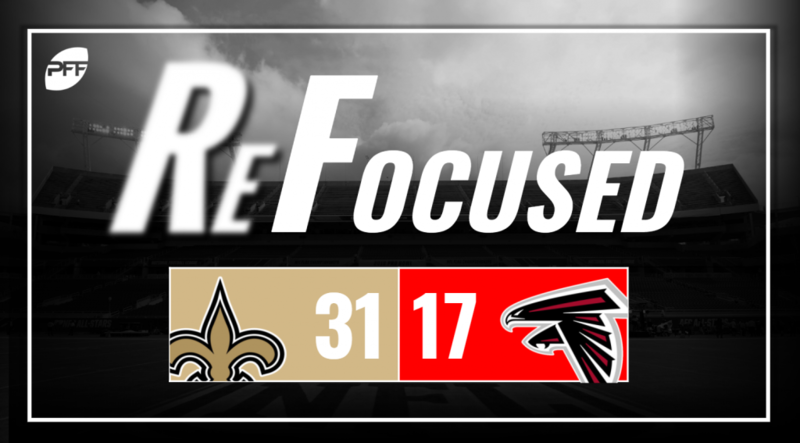 Atlanta misses Deion Jones badly, as Duke Riley and De’Vondre Campbell struggled to match up in coverage against the accuracy of Brees and his plethora of weapons. If there was a bright spot for the defense, it was the play of defensive tackle Jack Crawford, as he was able to sack Brees and was strong in the run game. Grady Jarrett was solid as well but didn’t dominate to consistently push the pocket. Despite the lack of scoring and turnovers, Matt Ryan played pretty well for the Falcons. The fumbles that Ryan had were when he was in the throwing motion and there was not much he could do. His one interception was off of a batted pass. He did force the ball into coverage on a fourth down in the first half, but that was about his only blemish on the night. The Falcons’ offensive line had an extremely poor night. The Saints’ defense tallied six sacks on the night and made some great plays in run defense in short yardage situations that the Falcons desperately needed. At the level Brees is playing right now, the opposition will need to play a flawless game to beat him. He’s the front-runner for the MVP and now can enjoy his Thanksgiving with a big win. Look no further than ball security on offense for the Falcons. Atlanta threw one interception and fumbled five times, losing three.